A last view of Apollo 11's Saturn V first stage as it separated at 38 miles high to drop into the Atlantic Ocean. Amazon.com CEO Jeff Bezos announced his team had found the stage’s engines more than 40 years later. Dot-com billionaire Jeff Bezos' announcement this week that he had not only located the engines that launched the first manned moon landing mission, but was also planning to recover at least one of them from the ocean floor came as just as much a surprise to NASA as it did to the public. "We read Mr. Bezos's blog post with the same excitement as I am sure others have today," Robert Jacobs, NASA's deputy associate administrator for communications, wrote on Wednesday (March 28) in an e-mail to journalists. "We have not had any formal contact with Mr. Bezos about the Apollo engines but we look forward to hearing more from his team and the recovery expedition." Bezos, the founder of Amazon.com and Blue Origin, the latter a commercial spaceflight company competing to launch astronauts to the International Space Station, wrote on his Bezos Expeditions website that his team had found the five F-1 engines that powered the first stage of the Saturn V rocket that launched Neil Armstrong, Buzz Aldrin and Michael Collins on the Apollo 11 mission in July 1969. Bezos wrote that his effort to recover the Apollo 11 engines would be privately-funded but also acknowledged that despite the engines being lost on the ocean floor for more than 40 years, they still belonged to NASA — a status the space agency cited on Wednesday. "The rules regarding NASA property in the ocean are the same as those that govern [federally-owned] sunken ships and other government property, including our hardware on the moon and other celestial bodies," Jacobs said. "As Mr. Bezos points out in his blog, the federal government retains ownership until the property is properly disposed." "However, we do not see that as any impediment to the recovery efforts of the Apollo engines," Jacobs wrote. Bezos' attempt to recover the Apollo 11 engines won't be the first time a privately-funded expedition has sought to recover sunken NASA hardware. Virgil "Gus" Grissom became the second U.S. astronaut to fly into space, launching in the "Liberty Bell 7" Mercury spacecraft in July 1961. The suborbital flight took just 15 minutes from liftoff to splashdown. After the capsule was back on Earth, its hatch unexpectedly blew open and the capsule subsequently sank to the ocean floor. The day before the 38th anniversary of its sinking, Liberty Bell 7 was raised to the surface and recovered on July 20, 1999. Leading the Discovery Channel-financed expedition, underwater salvage expert Curt Newport returned the only U.S. manned spacecraft lost after a successful mission. It was not long after that Newport turned his attention to another set of lost space artifacts: the first stages of the Apollo Saturn V rockets and their F-1 engines. "I concluded that the S-1C boosters from Apollo 8, 9, 10, 11, 13, and 16 landed in roughly a 5 by 11 nautical mile area," Newport wrote online in 2002. "I imagine that many of the F-1 engine bells would have survived and at least some of them should be recognizable and capable of being recovered." A NASA history publication, "Apollo by the Numbers," lists the Apollo 11 first stage impacting the Atlantic Ocean at 30.212 degrees North by -74.038 degrees East, about 360 miles of the coast of Florida. The coordinates however, are only theoretical, based on historical flight evaluation and post-flight trajectory reports. A German ship however, was in that vicinity on July 16, 1969 — the day Apollo 11 launched — and was rained on by debris from the Saturn V's first stage. An almost foot long fragment of the booster fell on the vessel's deck. Bezos did not share what resources his team used to limit their sonar search for the engines, or how they identified their target as originating from Apollo 11, as opposed to the dozen other Saturn V first stages on the ocean floor, outfitted with five engines each. 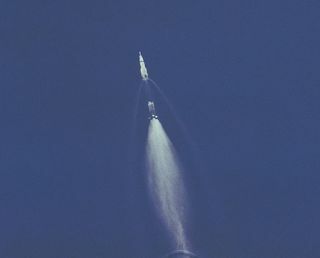 But locating the engines may turn out to have been the simpler challenge when compared to what will be needed to raise one or more to the surface. "The Saturn stages could certainly be found, but it is deep water and would be an expensive undertaking," Newport wrote on collectSPACE.com's discussion forums in 2007. "Does anyone on here know any millionaires?" Bezos, who is self-funding the expedition, is a billionaire but there will be other challenges to recovering the engines too, Newport said on Wednesday. "If they're intact, they're like 9 tons each," Newport told MSNBC.com's Alan Boyle. "That is not going to be easy to bring to the surface."